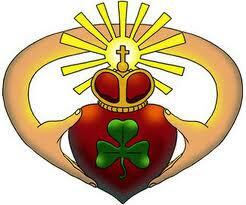 The traditional Irish friendship symbol is the claddagh. An Irish fisherman, Richard Joyce, who had been captured and sold into slavery by Barbary pirates as he was being transported to the sugar plantations of the West Indies, designed the claddagh in the 17th century. The claddagh is a symbol of two hands clasping a heart that is topped by a regal crown. The two hands symbolize friendship and the heart offers a token of love. The crown stands for fidelity and loyalty. Joyce, who learnt his trade as an apprentice to a goldsmith, created this Irish friendship symbol into a ring. It was a fitting tribute to his beloved who had remained true to him in the fishing village of Claddagh, patiently waiting for his return. Their marriage was sealed with the claddagh ring, an enduring symbol of their love and friendship. The true bond between friends is idealized in a claddagh Irish friendship symbol, which makes it a perfect reflection of strength and protection as the hands cradle the heart. Giving an Irish claddagh ring to a friend is considered the epitome of your friendship as this ring will be treasured for years to come. Many claddagh rings commemorate happy occasions and have become family heirlooms. You can buy an Irish friendship symbol from specialty jewelry stores or online from Celtic jewelry websites. Often shaped from sterling silver, the claddagh friendship ring can be engraved with the name of your friend or loved one to make your gift more meaningful. Some friendship symbol rings come in yellow gold and occasionally a gem replaces the crown or heart. You can have this Irish friendship symbol custom made to snugly fit the ring finger of your friend or designed with your choice of precious metal and gemstones. Birthstones are a favorite selection of buyers and jewelers can ship the stylish ring to many parts of the world. The claddagh ring remains an everlasting Irish friendship symbol that is often worn and treasured by the recipient for years. This symbol is usually crafted by jewelers from precious metals like silver and gold, with gemstones. Seal your friendship with a claddagh ring today!